Researchers from the Faculty of Chemical Technology, Kaunas University of Technology (KTU), Lithuania are developing an artificial bone, which can be used for treating of the most common joint disease – osteoarthritis. The bi-functional composite imitates the complex osteochondral structure of a joint, i.e. both cartilage and bone tissues. According to the World Health Organisation, around 10% of male and 18% of female population over 60 are suffering from osteoarthritis. The onset of the condition is associated with thinning of the cartilage due to age; on average, people over 55 feel pain in 4 joints. The most common in the world inflammatory bone and cartilage disease, osteoarthritis, generally affects knee, hip, spine and tarsus. While common treatment for osteoarthritis is pain or anti-inflammatory medication available as pills, syrups, creams or lotions, KTU chemists are offering a novel approach, i.e. using a bi-functional scaffold as an implant compensating cartilage and bone defects. "A lot of people are suffering from painful joints, and the majority of them have osteoarthritis. To create new composites for solving this problem is especially challenging – cartilage tissue is renewing itself at a very slow rate, and it forms a complex structure together with a bone", says Simona Miseviciute, an applied chemistry undergraduate, who was conducting the experiment under the supervision of Dr Alisa Palaveniene. The bi-functional scaffold, created at KTU aims to compensate defects of both cartilage and bone. Made of several different substances – hydroxyapatite, gelatine and chitosan – the scaffold imitates the complex osteochondral structure and functionality of the joint and fills the fractures of the two different tissues. 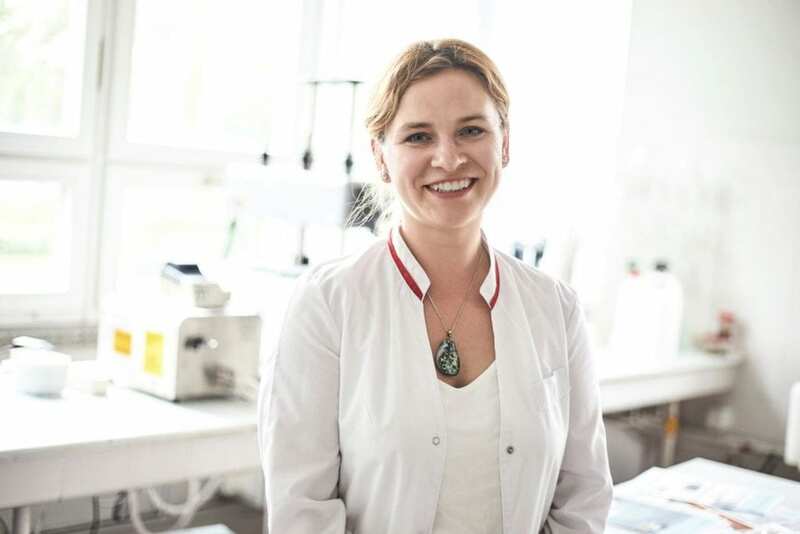 "Development of new scaffolds for regenerative engineering and implementing them in contemporary medicine is of utmost importance – to my knowledge, bi-functional scaffolds imitating complex osteochondral tissue currently are not used in medical practice", says Miseviciute. The scaffolds were modelled by layering polymer combinations, and the porous structure of a scaffold was achieved by lyophilisation, i.e. freeze drying. Elemental analysis, bio imitational mineralisation, degradability and water absorption of the composite scaffold were among the parameters measured during the experiment. The tests have shown that the samples were highly hydrophilic, which suggests functionality of the scaffold. "To create bi-functional scaffolds for human bone engineering, interdisciplinary knowledge of chemistry, biology, pharmacy, anatomy is being used. The new research is aiming to solve most urgent problems of today's ageing society. Although these experiments are just a beginning of a great endeavour, we are happy to be keeping pace with global tendencies", says Dr Palaveniene.